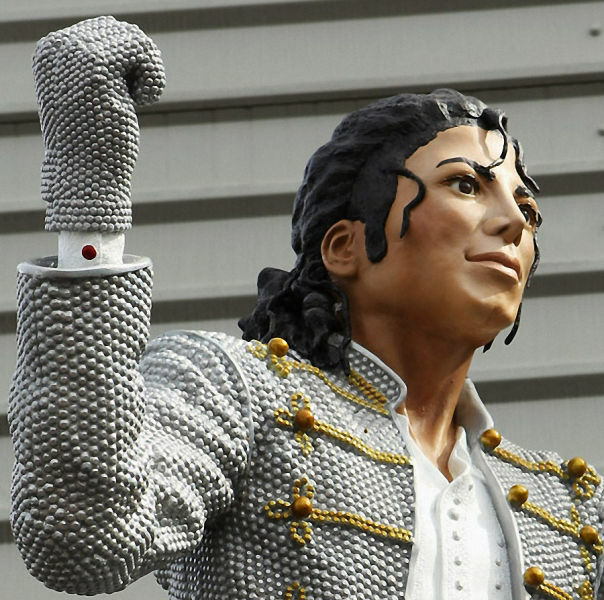 A kitsch art statue of Michael Jackson was recently unveiled outside the stadium of Premier League in London. 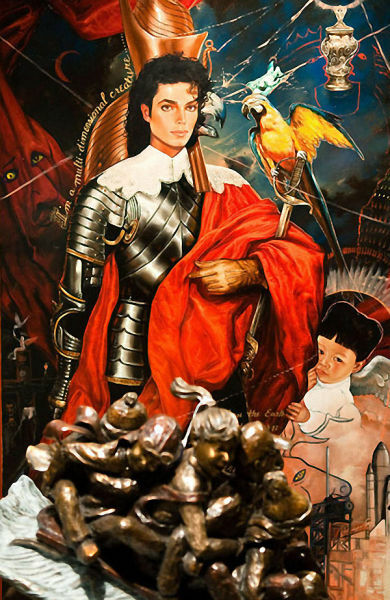 The King of Pop loved kitsch art, and there are a lot of other examples of it, including paintings and statues, in his house and around the world. Chairman Mohamed Al Fayed presented this statue commissioned in memory of his friendship with the famous singer. He said that if some fans didn't understand and appreciate such a gift, they could go to hell. Fayed assured it would become a mecca for Jackson fans. He believes that people will visit it from all over the UK. The statue, believed to have cost around £100,000, was originally planned for Harrods but, having sold the store, Fayed decided to erect it at Craven Cottage instead. Jackson saw a game at Craven Cottage in 1999. 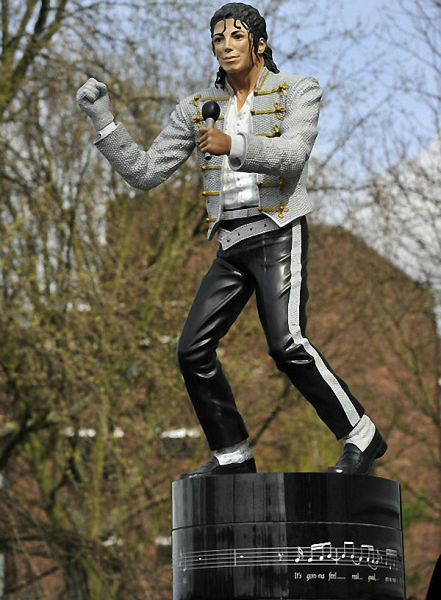 Michael Jackson would probably have approved of the Fulham statue. 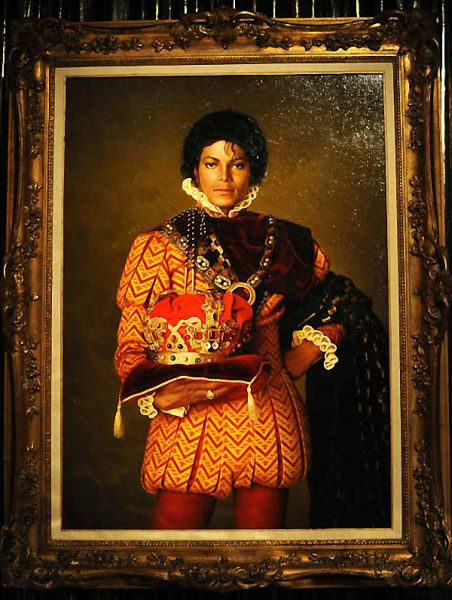 The walls of his Neverland ranch were adorned with many kitsch, self-mythologising portraits of himself, such as this oil painting of the star dressed as a king in Elizabethan costume, painted by Norman Oak. 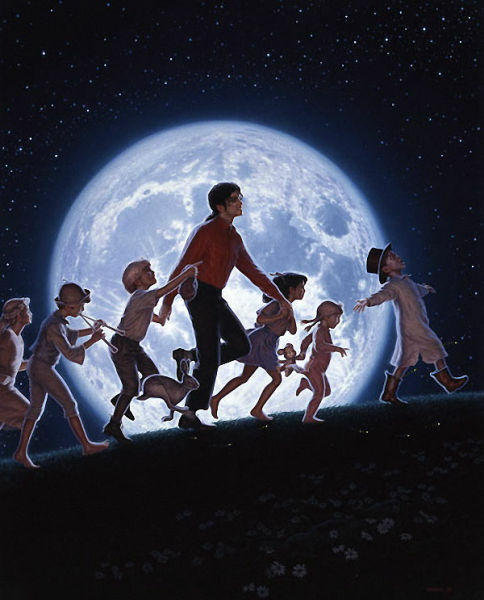 Jackson's main go-to man for over-the-top portraits of himself was David Nordahl. 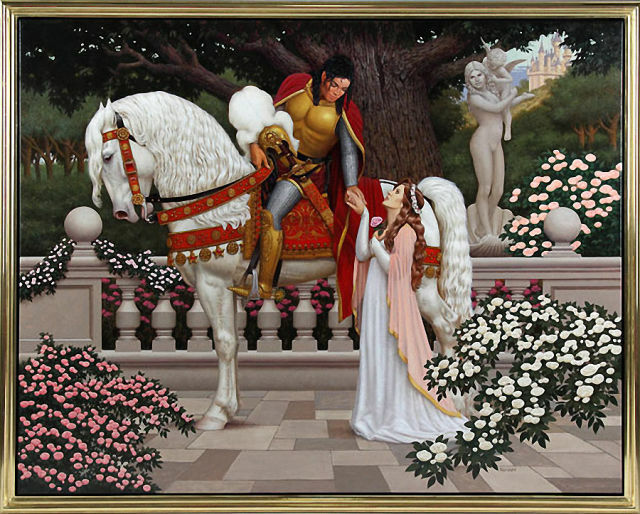 Over a 17-year period, Jackson commissioned flamboyant paintings such as "Camelot", a 1995 portrait of Michael Jackson and his wife Lisa Marie Presley. 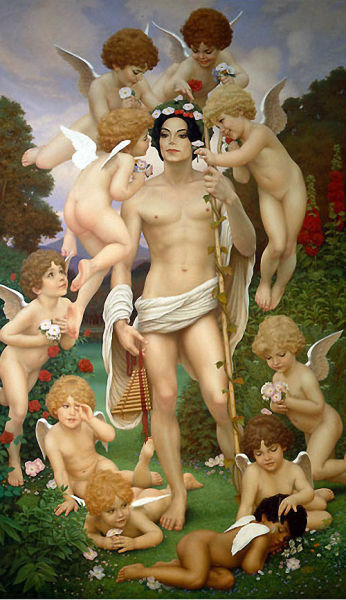 This Nordahl painting was seemingly modelled on Michelangelo's David, with half naked cherubs surrounding the star. 'Moonrise', by artist David Nordahl. 'The Triptych, by David Nordahl. 'Field Of Dreams', by David Nordahl. 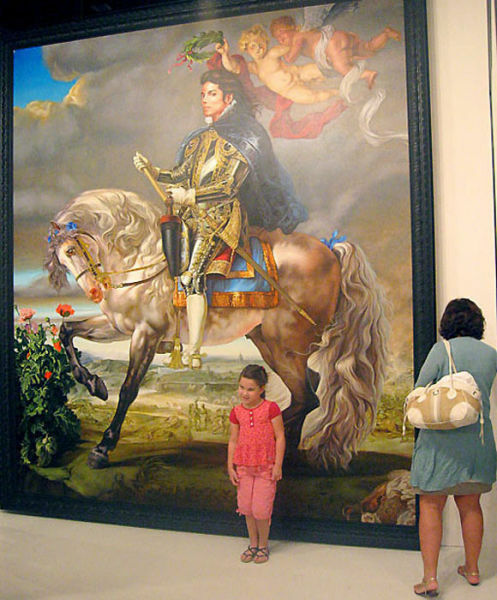 Equestrian Portrait of King Philip II, 2009, by artist Kehinde Wiley. The portrait was sold to a German collector for $175,000. 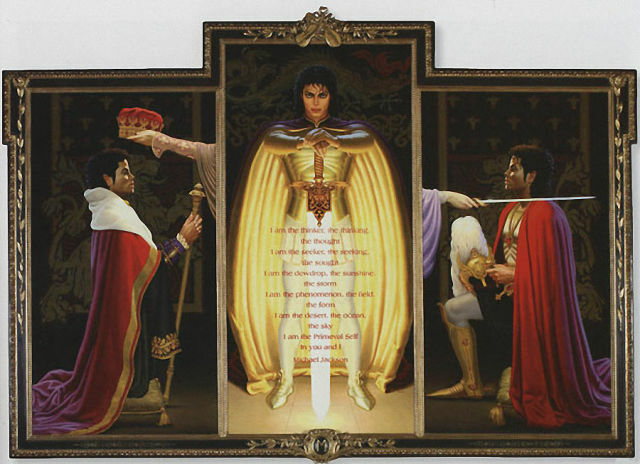 Jackson had commissioned the portrait in 2008. He never saw the finished painting. A painting of himself wearing a suit of armour, with a parrot on his shoulder, a child holding onto one leg and a monkey at his feet. A quote written on the painting reads: "I'm a multi-dimensional creature". 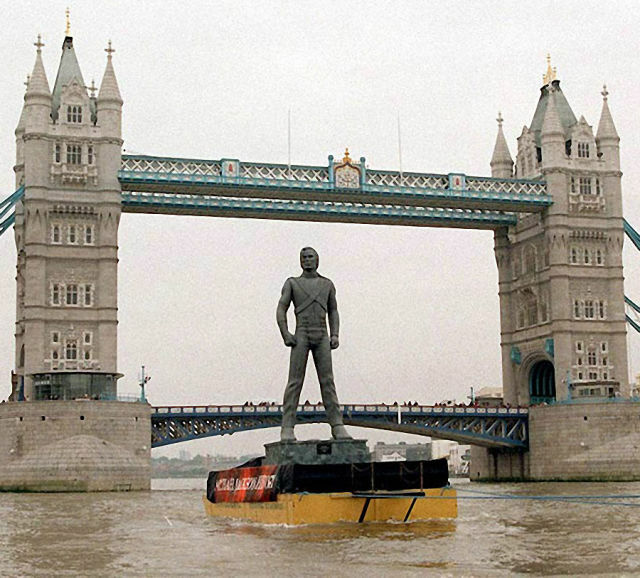 In June 1995, a 10-metre-tall statue of Michael Jackson was towed along the Thames to promote the release of the grandiosely-titled album, HIStory Past, Present and Future, Book 1. 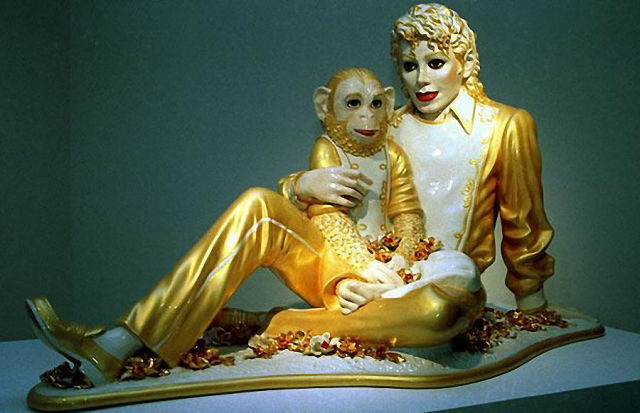 Michael Jackson and Bubbles by Jeff Koons, one of three life-sized gold-leaf plated porcelain statues of Jackson cuddling his pet chimpanzee. One of these sold at Sotheby's New York for $5.6 million in 1991. 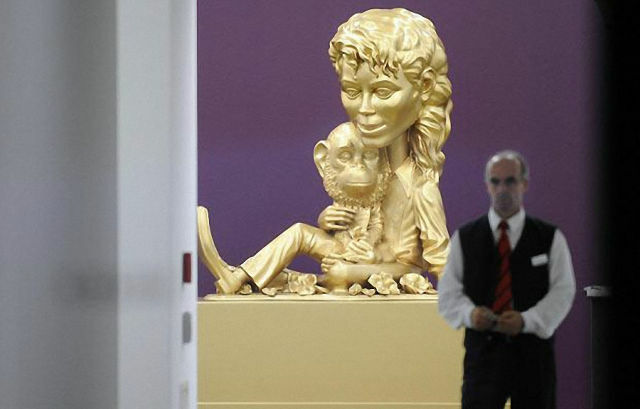 Michael Jackson and Bubbles (Gold) by US artist Paul McCarthy. 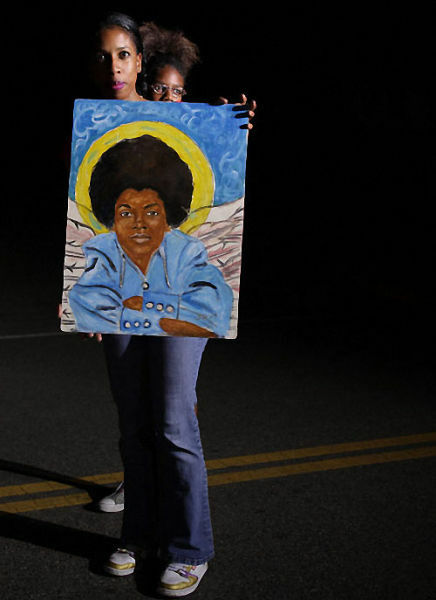 After Jackson's death, many fans got in on the act, paying tribute to him by painting portraits of him as a saint or heavenly angel. 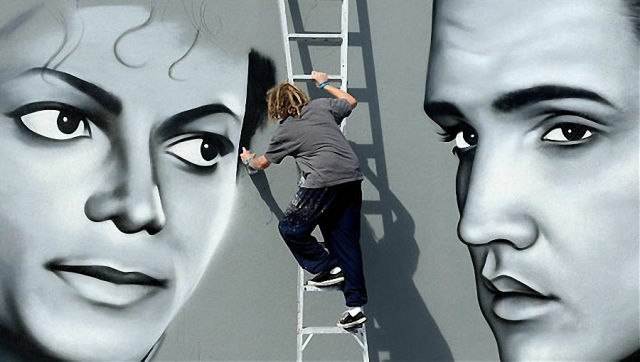 In March 2010, graffiti artist Owen Dippie created a mural titled "Two kings of rock'n'roll" in Tauranga, New Zealand. 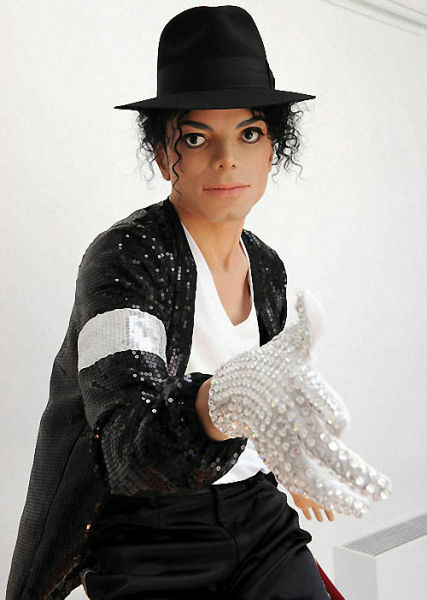 To mark the first anniversary of Michael Jackson's death, French artist Jean-Baptiste Seckler created this creepily realistic life-size sculpture of the King of Pop. I don't see a monkey at his feet, maybe it's blocked by the other stuff in the picture. Anyway, I bit it wasn't MJ's idea to add the parrot and monkey in the painting, with that Chinese child, more like a jealous envious racist who came with that idea. Being the nice person MJ was just accepted the painting anyway.